Medium duty decorative scroll bracket for hanging address plaques and signs. Made from twisted steel rod, with steel back plate, and topped with decorative scrollwork. It's finished off with your choice of finial. Choose from ball, Fleur de Lis, pineapple, and spear. Available for small, medium, and large signs up to 48" width. This bracket is designed for medium duty applications. The 24" sign bracket has a length not including finial of 26". Ring centers are 14" apart (+/- 1/2"). Backplate is 3" wide, 12" tall, 3/16" thick and has four 5/16" diameter mounting holes. For signs up to 24" wide. Pictured in main image above with a ball finial. Twisted steel shaft is 1-3/8" diameter. Ball finial and pineapple finial adds 2.5" in length. Fleur de Lis finial adds 4.5" in length. Spear finial adds 6" in length. The 36" sign bracket has a length not including finial of 38". Ring centers are 22" apart (+/- 1/2"). Backplate is 3" wide, 14" tall, 3/16" thick and has four 5/16" diameter mounting holes. For signs up to 36" wide. Twisted steel shaft is 1-3/4" diameter. Ball finial adds 2.5" in length. Pineapple finial adds 3" in length. Fleur de Lis finial adds 9" in length. Spear finial adds 6" in length. The 48" sign bracket has a length not including finial of 50". Ring centers are 30" apart (+/- 1/2"). Backplate is 1" wide, 14" tall, 3/16" thick and has four 5/16" diameter mounting holes. For signs up to 48" wide. Twisted steel shaft is 1-3/4" diameter. Ball finial adds 2.5" in length. Pineapple finial adds 3" in length. Fleur de Lis finial adds 9" in length. Spear finial adds 6" in length. Please note that finial is a permanent attachment and is not removable or interchangeable with other finials. Powder coated satin black finish. Special order. Please allow 2-3 weeks for delivery. Medium duty decorative scroll bracket for hanging address plaques and signs. 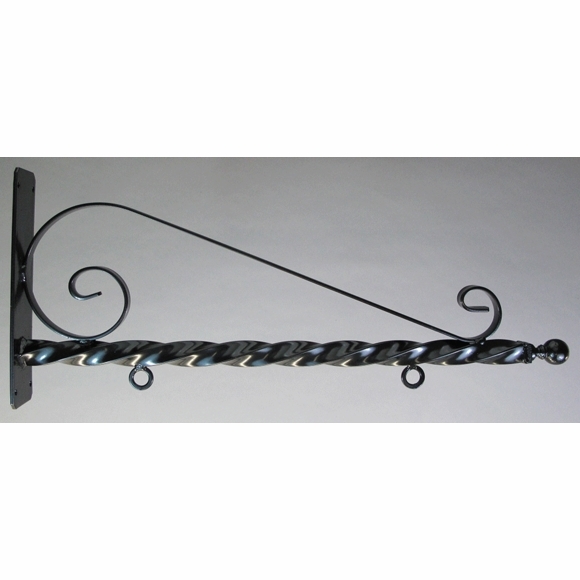 Made from twisted steel rod, with steel back plate, and topped with decorative scrollwork.